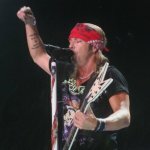 Poison frontman Bret Michaels has said he hopes his band will tour in 2015 with either Def Leppard or KISS. Bret has told the Chicago Tribune he has his "fingers crossed" for a co-headline tour in 2015 with either band. Drummer Rikki Rocket posted a tweet in February which ruled Poison out of the Summer Tour 2014 with Lep/KISS suggesting one member was "making it a problem". Bret's solo album 'Jammin' With Friends' featuring Phil Collen was released in June 2013. In July 2013 Bret stated that Poison would be touring in 2014 with Def Leppard at a show in Kansas City. Def Leppard and Poison last toured together with Lita Ford opening on the Rock Of Ages tour in 2012. "I'm keeping my fingers crossed Poison will be doing a handful of dates by ourselves at the end of the year and then next summer we could co-headline with Def Leppard or Kiss or whoever."